After four consecutive defeats, with ten goals conceded, a clean sheet and a draw was a step forward. But with more clinical finishing Latics could have won by a wide margin. Although not playing well Wigan still managed to create a hatful of opportunities against a mediocre Reading team. Paul Cook made two changes to his starting line-up, with Sam Morsy coming back from suspension to replace Lee Evans with Kal Naismith coming in for the injured Antonee Robinson. He persisted with the 4-4-1-1 system, with Josh Windass playing behind Nick Powell. The injury to Antonee Robinson was a tough one for Cook with no other specialist left back in the squad to replace the Liverpudlian. The manager could have switched Nathan Byrne or Reece James to the left or brought in Callum Connolly who has experience playing in that position with the Everton development squad. But Cook clearly prefers a left footer in that position and continues to show belief in the ability of Kal Naismith to make it at Championship level. But given Naismith’s apparent unease in previous games in playing on the left of defence it appeared to be a risky proposition. However, Naismith did well and came close to Reece James as Latics’ best performer on the day. He played particularly well in the first half, showing excellent movement, vision and change of pace. His crossing was impressive. His excellent block of substitute Danny Loader’s volley in the closing minutes helped save a point for Latics. Whether Naismith will retain the left back position in the upcoming games against Blackburn and Bolton remains to be seen. He had Sone Aluko, a left footed midfielder more likely to cut inside rather than race down the touchline. If Bolton were to play Yanic Wildschut on the right wing on Saturday, Naismith could be severely stretched defensively. The sight of Christian Walton seemingly wasting time on a goal kick in the dying minutes of the game did not go down well with the home fans. After all, Latics were drawing with a team in the relegation zone. Under Jaap Stam, Reading played patient possession football, finishing in third place, being narrowly defeated in the Championship playoff final by Huddersfield Town. Since then they have slipped down the table but continue to play in the same vein under Paul Clement. Not surprisingly Reading had 57% possession compared with Wigan’s 43%, but it was the ease with which they were able to bypass the Latics middle line that gave cause for concern. Fortunately for Wigan the final pass by Reading was rarely incisive and the home team’s back four held up well. But those gaps in the central midfield were noticeable. With Morsy’s return Cook had to choose between Darron Gibson and Lee Evans for the second position in holding midfield. Gibson was his preference. But what was surprising was that when Gibson was withdrawn after 84 minutes it was Callum Connolly who was brought on. Despite his indifferent performances of late, Cook gave Gibson a vote of confidence yesterday by putting him in the starting line-up. But the manager will surely be considering bringing back the Welshman for the Blackburn game on Wednesday. Evans is not only a solid holding midfielder, but a creative force going forward. His creativity was sorely missed. Moreover, Evans and Morsy work particularly well as a partnership in the centre of the pitch. Cook was reacting to the fans’ disappointment that Callum Connolly, not Callum McManaman, was the third and final substitute for Latics with six minutes left on the clock. Cook’s unwillingness to use McManaman, a potential match winner in such situations, was certainly frustrating, even if the manager was basically saying that he was happy to settle for a draw. But it is not so much Cook’s decision in this game, but his treatment of the unpredictable McManaman over the course of the season so far, that has been hard to fathom. McManaman has played a total of 210 minutes in the Championship this season, an average of 12 minutes per match. He is on a one-year contract. But Cook insists that the player will have a part to play. In August Latics were attacking with abandon, scoring 11 goals in the five league games played. They were exciting to watch, if somewhat naïve. Since then they have scored just 8 goals in the last 13 games. Their tactics have changed from a high pressing game based on high tempo attack to a more defensive approach with the long ball prevalent. The approach in the second half yesterday was symptomatic of what we have seen too often in recent weeks. But there are mitigating factors. Injuries to key players have proved a hammer-blow. Moreover, the fixture list saw Latics having to play against so many high-flying teams in recent weeks. At the start of the season Cook had a squad high on confidence after winning League 1. Now he has the opposite, with a need to build up confidence lost by a series of bad results. Cook must first rebuild his team’s morale, before returning to a more attractive tactical approach. Given the circumstances no manager in Cook’s place would attack with abandon against Blackburn. But a little more attacking flair in the line-up would not be amiss. McManaman or Leo Da Silva Lopes in one of the wide positions might help. In the long run, with confidence restored, we can expect Cook to return to a more attractive brand of football than we have seen of late. It was by no means a classic, but the three points gained have put Wigan Athletic in the top half of the Championship table. Hull City had given the Latics defence some early problems, but well taken goals from Sam Morsy and Josh Windass put Wigan two goals up before Jarod Bowen scored for the visitors in the 42nd minute. The second half saw Latics mount a largely rear-guard action, although they still managed to threaten the visitors’ goal in spells. Although it is early in the campaign Paul Cook’s Latics have already shown that they have the confidence and ability to hold their own in the second tier of English football. After the first 8 games their record is W4 D1 L3. At this stage a couple of seasons ago Gary Caldwell’s team were sitting in 22nd place, with a record of the W1 D2 L5. Dicko was signed from Strasbourg by Roberto Martinez as a 19-year-old in 2011. After three loan spells for Blackpool, Rotherham and Wolves he signed for Wolves in January 2014. His appearances at Wigan had been confined to cup games. He has now made 172 league appearances, scoring 50 goals. Dicko’s pace and aggression caused problems for the centre of Wigan’s defence and with a little more poise he might have scored. He remains a force at Championship level. Fortunately for Dunkley and Kipre he was taken off after 61 minutes, his team resorting to long crosses with which the two big centre backs looked much more comfortable. In the event the calibre players coming in were to be Grigg and Michael Jacobs. Although closely marked Grigg worked hard and it was his unselfish play that led up to Morsy’s goal. Jacobs’ enterprise and flair had been sorely absent at Griffin Park, but it was certainly evident last night. The line-up certainly had a more balanced look. Following the Brentford game Cook had intimated that Latics might appeal Morsy’s red card. He will be glad he did so because the captain was back on form last night, not only scoring a cracking goal, but showing the kind of industry in midfield that we have come to expect from him. Cook’s substitutions proved to be effective last night. He took Grigg off after 65 minutes, pushing Nick Powell forward, with Darron Gibson coming on to strengthen the central midfield. Kal Naismith was brought on to replace Windass after 82 minutes and he put Jacobs through on goal five minutes later with a fine run and pass. Powell proved a handful for the Hull defence at centre forward until he went off in the 89th minute. Hull had stepped up the pressure in the second half and Latics had been pushed back into defence. The midfield was being overrun and Wigan just could not seem to hold on to the ball. The introduction of Gibson certainly helped. Gibson has an aura of calm about his play that can influence those around him. He is resolute in defence and rarely wastes the ball. Providing Gibson can steer clear of further injury he has the class to be a major player for Latics. Josh Windass made his goal in the 37th minute look easy, but how many of his teammates would have taken the opportunity like he did? It was reminiscent of one he almost scored in his debut at Villa Park. A cross into space at the far post from Lee Evans. First time around Windass got his head to the ball, but it went narrowly wide. But guessing what Evans was going to do last night, Windass got into space and firmly headed into an empty net. At first glance it looked like it might have been offside, but the timing of his run was just right. Windass is not a winger in the orthodox sense. He does not have the dribbling skills of Michael Jacobs, not the searing pace of Gavin Massey, yet Cook plays him in a nominally wide position. In times gone by Windass might have been employed as a twin striker in a 4-4-2 system. However, most managers these days prefer a lone central striker with support from the flanks and central midfield. In Latics’ Premier League days Roberto Martinez experimented by putting centre forward Hugo Rodallega on the left wing. It did not work for Rodallega, nor Mauro Boselli who was starved of service in the centre. However, in this new era wingers are more than ever expected to cut in and shoot. Windass is used to playing wide and with Garner, Grigg and Vaughan competing for the centre forward spot Cook clearly signed Windass to play a wide role. Latics have so often this season put teasing crosses into the box with no end result. Windass could play a key role in converting them into goals, ghosting inside from a wide position. Once again one wondered if Cook would give the young full backs, Reece James and Antonee Robinson, a rest. But the manager resisted those options, and both were excellent last night. Robinson was back to his more energetic self in supporting attacks down the left, putting in a solid defensive shift. James is such an accomplished player at just 18 years of age that it would seem a matter of when, rather than if, he will make a full international debut for England. He was outstanding last night, judicious in defence and inventive in attack. What a pity that neither player belongs to Latics! Wigan Athletic rarely start the season with a victory, but this one was an exception. Not only did Latics pick up the three points, but they did it in style. There were concerns about the back four, with three debutants starting alongside Chey Dunkley. Other than that Paul Cook had kept faith in the players who had performed with success last season, with the exception of Darron Gibson who was preferred to Max Power. After last season when so many teams tried to “park the bus” at the DW this was refreshing. 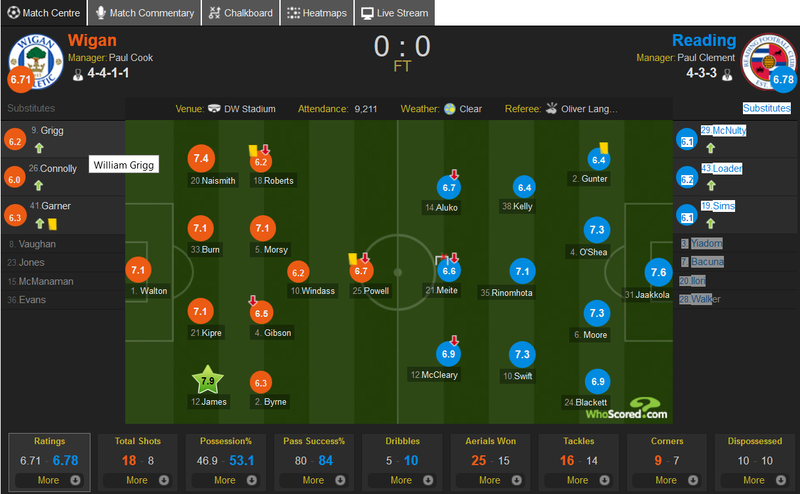 Wednesday had come to play an attacking game and Wigan more than matched them. Latics had been 3-1 up when the Argentinian, Fernando Forestieri, finished off a slick move in the 67th minute. But rather than close the game down by packing their defence Latics continued to attack. There were some nervy moments for the Wigan defence with the 6 ft 3 in Wednesday substitute Lucas Joao causing problems after he joined the combative 6 ft 5 in Kosovan battering-ram Atdhe Nuhui up front. But at the other end Latics’ enterprising football caused constant problems for the Sheffield defence. As the clock counted down one wondered whether we would see Cook’s team hold the ball in the corners, time-waste and keep possession in the manner that is so prevalent in the modern game. But to the manager’s great credit they did not do that, but continued to hone in on the Wednesday goal at every opportunity. How many managers are there in the modern game who would do that? Darron Gibson has had a frustrating career after starting at a young age for Manchester United. Niggling injuries and off the field issues have led to him not being able to realize his full potential. He had his critics among Latics fans even before he signed a short term contract with the club. But yesterday he surely silenced his critics. The 30 year old played a key role in holding midfield, his vision and the precision of his passing adding an extra dimension to Latics’ play. Michael Jacobs scored two opportunist goals, hit the woodwork with a cracking shot and played a key role in the third goal. Moreover he worked hard on the defensive side of his game, tireless in his harrying of the opposition. There have been questions about the player’s ability to truly succeed in the second tier. He was not an automatic choice at Derby or Wolves. Although he was one of the first names on the team sheet under Gary Caldwell and Warren Joyce he struggled to dominate Championship defences in the 2016-17 season. But so often under Joyce he was chained to defensive duties at the expense of his attacking forte. Yesterday he played at probably his highest level since he has been at Wigan. His intelligent movement and ability to find space made him a constant threat to the visiting defence. When he came on after the interval he received a great ovation from the crowd in the east stand following a sparkling first half. He looked like a player on a mission to show us that he can be a force in the Championship division. He went a long way towards proving that yesterday. Gavin Massey too has had his doubters, but yesterday he looked a class act, showing blistering pace and a fine touch on the ball. Perhaps the second tier will be more to his liking, away from the up and tumble of League 1? The signing of Cedric Kipre from Motherwell was a surprise to most of us who had never heard of him before. On first sight some wag in the crowd suggested we have two Chey Dunkleys playing, likening the two players not only in their physique, but in their rugged defending. Another likened him to Arouna Kone who sported a similar hair style. When Dunkley was signed from Oxford United he had only played one full season in league football. Dunkley proved himself to be a very capable player at League 1 level, although there were questions as to how he would cope in a higher division. He had a fine game yesterday dealing with Nuhui who has been a thorn in the side for previous Latics teams. Kipre too has only had one season of league football, that being in the SPL. But he looked a force to be reckoned with yesterday, with not only an imposing physique, but pace to match. The signing of Kipre raised concerns among fans that Dan Burn might be leaving. This was backed up today by reports suggesting that Brighton have offered £3m for him. Once again it may be mere speculation but Latics fans will be hoping there is no truth in it. Burn is a prize asset with a wealth of experience in the Championship, a key player in Cook’s team. However, Burn is not the only one who could be gone in the coming week, with the club still having not tied down contracts with so many of its top players. The uplifting start to the season could soon fall flat if Burn or other such pivotal players depart. But we have become accustomed to the wheeler-dealing that happens as the transfer deadline approaches. If one of more of those players does leave we can surely expect more new arrivals. The Liverpool Echo article, published on June 18, told us that the IEG would appoint Joe Royle as Director of Football at Wigan Athletic were a takeover to take place. The 69-year-old would use his experience and contacts to recruit new players for the club. But six weeks have since passed, the takeover has not yet happened and the EFL transfer window closes on August 9. Paul Cook remains tight-lipped in his comments about the takeover, although Alan Nixon’s tweet gives us an inkling as to the climate in which the manager is currently working. Nixon remains the main source of titbits about the current situation at Wigan Athletic. He is particularly active on Twitter, where his accessibility gives fans the chance to ask him for information on their clubs. If Nixon is correct about the takeover being likely to happen in mid-August, what does it mean for recruitment up to August 9? Up to this point Cook has signed three players on permanent contracts over the summer. Kal Naismith was recruited as a free agent from Portsmouth. Callum McManaman took a pay cut to come back to Wigan from Sunderland. Although the fee is “undisclosed” it could well be minimal, as the north east club look towards slashing their costs following relegation to the third tier. However, Cook was allowed to splash cash in acquiring Leonardo da Silva Lopes for some £750,000-plus from Peterborough. But given the uncertainty regarding the ownership of the club, will funds be made available for him to compete on an even keel in the transfer market? Given the norms over recent seasons at the club and the continued tenure of David Sharpe as chairman the likelihood is that Cook will have to recoup funds from transfer fees before spending further. Both Ryan Colclough and Devante Cole are likely to be leaving soon, whether on permanent transfers or loans. James McClean has moved from West Bromwich to Stoke for some £5m, with Latics reportedly due to receive a sell-on fee amounting to somewhere between 15% to 20%. Rumours have suggested that Cook has been interested in signing Bradford City centre forward Charlie Wyke, with the Bantams asking for £750,000. However, the player has a knee injury which may deter current interest. In early May reports told us that Everton were interested in signing the 19-year-old Callum Lang, whose contract is due to expire next summer. There has since been no news from Wigan about an extended contract for the player who was not in the squads for the pre-season games at Tranmere, Chesterfield and Rangers. Should a reasonable offer come in for Lang in the next 10 days it will be interesting to see if Latics are willing to let go a young player of significant potential. But Lang is not the only player in the last year of his contract. The list includes last season’s regulars Dan Burn, Nathan Byrne, Gavin Massey, Sam Morsy, Nick Powell and Max Power, together with Jordan Flores, Shaun MacDonald and James Vaughan. No news has been forthcoming from the club about new contracts being signed and the transfer deadline approaches. The Whelan family policy in the past has typically been that players can leave if Latics are offered what they consider the right price. It is in the club’s interests to tie down contracts to those that Cook wants to keep, rather than have them leave as free agents next summer. The worst-case scenario is key players leaving close to the transfer deadline, with no replacements in hand. The EFL brought forward the closing date of the summer transfer window from September 1 to August 9 for the 2018-19 season. However, the deadline for signing loan players and free agents is August 31. The Sun newspaper suggested on Sunday that should the Wigan takeover happen in time then Callum Connolly, Kieran Dowell and Antonee Robinson might be loan targets. Connolly is known from his previous spell at the DW where he was used as a right back. Dowell is an attacking midfield player and Robinson a left back, both with successful experience on loan in the Championship. Of the three it is Robinson who would most likely to the main target for Cook, given his problems with the left back position. However, a return for Callum Elder from Leicester cannot be ruled out, whether on another loan or a permanent transfer. Matthew Pennington is a 23-year-old central defender for whom Leeds United paid a reported £500,000 loan fee to make 24 appearances for them last season. Meanwhile we await a decision on 30-year-old midfielder Darron Gibson’s future at Wigan. Cook already has McDonald, Morsy and Power vying for holding midfield positions, but Gibson’s experience could be useful. The other trialists, James Perch and Ross Wallace, are reported to have left the club. Perch is an old fan favourite at Wigan and many were hoping he would be signed. His versatility in being able to play anywhere in the defence or in holding midfield must have been a plus. Some fans suggested Cook might have had him in mind for the left back position but given the way the manager employed his full backs last season it was unlikely. Moreover, the player had injury problems last season and made only 6 league starts for QPR. 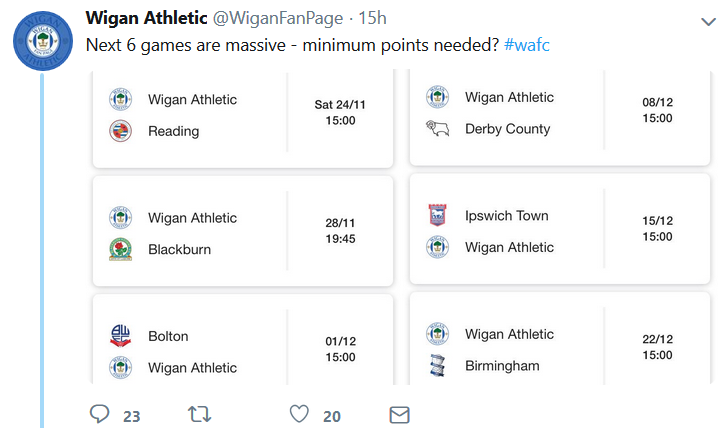 Change is certainly in the air at Wigan Athletic, with ownership issues clouding recruitment policy. The interaction between the Whelan family and IEG is not known to the public. Rumours have been circulated that Joe Royle has attended recent games and together with Nixon’s tweets about Everton loan players it appears that there have been efforts to provide a smooth transition in the control of the club. Moreover, the implications are that it is IEG who have been providing financial support over the summer rather than the Whelans. Ownership issues apart, we have learned that activity increases as the transfer deadline approaches. Latics fans will be hoping that Cook can keep hold of the players who formed the backbone of the successes of last season. Many will say that Gary Caldwell lost momentum by not keeping faith in the players that were in his League 1 winning squad. Cook has already made it clear that he believes in loyalty and we can expect most of those players to make the starting line-up against Sheffield Wednesday. He has also made it clear that he needs more new players. Following the defeat at Ibrox we have seen some gloomy comments on the social media and message boards. However, Rangers were always going to be a difficult proposition, playing in front of a large home crowd and being ahead in their physical preparation having already played three matches in the Europa League qualifiers. One of the key features of last season was the solidity of the defence, aided by having a consistent back four. Following Dan Burn’s departure at half time, Latics had only Chey Dunkley present from the back four that finished the season. The defence will surely tighten up when Cook finds a competent specialist left back to play with Burn, Dunkley and Nathan Byrne. In the meantime, we need to prepare ourselves for the rollercoaster ride that comes as the transfer deadline approaches. That deadline has been brought significantly forward, but did the EFL have to agree on the same dates as the Premier League, whose season starts a week later? The result is that managers at EFL clubs continue to be vulnerable to losing key players when the season has already started.